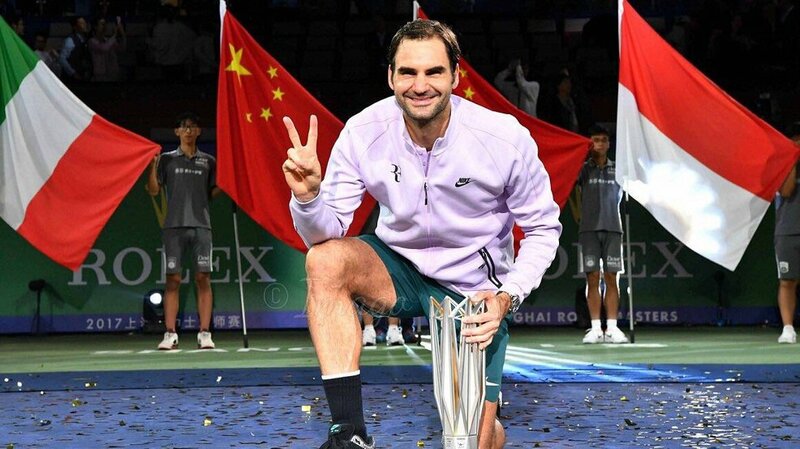 By defeating Rafael Nadal to capture the Shanghai Rolex Masters title on Sunday, Roger Federer continued an incredible 2017 revival that’s taken him all the way back to No.2, with No.1 within reach. 1. He won his second Shanghai title. Federer also won this title in 2014, beating Simon in the final (after beating then-No.1 Djokovic in the semifinals). Federer was also runner-up to Murray in 2010. 2. He won his 27th Masters 1000 title. Federer’s now 27-19 in his career in Masters 1000 finals, and he’s third place for most Masters 1000 titles all-time after Nadal and Djokovic, who both have 30. 3. He’s now beaten Nadal five times in a row. Starting with Basel in 2015 and now the Australian Open, Indian Wells, Miami and Shanghai in 2017, Federer’s beaten Nadal five times in a row. Keep in mind that before this year, Federer had never even beaten Nadal more than twice in a row. 4. He continued to close the gap in the career head-to-head with Nadal. Coming into the 2017 season, Nadal led Federer in their head-to-head, 23-11. Four Federer wins later, that’s now 23-15. 5. He improved to 11-9 against Nadal on hardcourts. Nadal leads 13-2 on clay, but Federer has edges on both of the other two surfaces, going 11-9 against him on hardcourts and 2-1 on grass. 6. He won his sixth ATP World Tour title of the year. Federer’s won the Australian Open, Indian Wells, Miami, Halle, Wimbledon and Shanghai, which ties him with Nadal for most ATP World Tour titles this year (he won Monte Carlo, Barcelona, Madrid, Roland Garros, the US Open and Beijing). 7. He won the 94th ATP World Tour title of his career. That ties Federer with Lendl for second-most ATP World Tour titles in the Open Era - they trail only Connors, who won 109 career titles. 8. He got his 350th career match win at a Masters 1000 event. Federer’s the first player to reach 350 career match wins at Masters 1000 events (Nadal and Djokovic are next with 343 and 308). 9. He recorded his 700th career match win on hardcourts. Federer’s victory over Nadal improved his career win-loss record on hardcourts to 700-142 (an incredible .831 winning percentage). 10. He got his 10th career win over a World No.1. It was his third such win over Nadal, having also beaten the Spaniard when he was No.1 in the finals of Madrid in 2009 and the ATP World Tour Finals in 2010. The other seven wins came against Djokovic (five times), Hewitt (once) and Roddick (once). 11. He improved to 10-1 against Top 10 players this year. The only loss against a Top 10 player came in the final of the Masters 1000 tournament in Montreal, falling to then-No.8 Zverev, 6-3 6-4. 12. He snapped Nadal’s 16-match winning streak. Nadal hadn’t lost since the quarters of Cincy to Kyrgios (he went 7-0 to win the US Open, 5-0 to win Beijing and 4-0 to reach the final of Shanghai). 13. He’s now 3-0 against Nadal in China. Federer’s won all three of the pair’s meetings in China - the first two were in the semifinals of the ATP World Tour Finals in 2006 (6-4 7-5) and 2007 (6-4 6-1). 14. He put the Masters 1000 titles back in the hands of the ‘80s babies. The last three Masters 1000 titles all went to players born in the ‘90s - Zverev in Rome and Montreal, Dimitrov in Cincinnati - which was all the more amazing given no player born in the ‘90s had ever even won one before. 15. He kept his hopes of year-end No.1 alive. It’s still a longshot, but Federer has now cut Nadal’s lead in the year-to-date standings to 1960 points - had he lost, Nadal would’ve all but clinched it.